B E A R I N G.
Please bear in mind that both on parade and on your way there, you are representing the South Africa Legion and your comrades and you’ll be in the public eye. Black or Green blazer with SAL blazer badge on the left pocket. White or blue shirt (white preferred). Black or grey trousers with a black belt or, as alternative when wearing braces cut trousers, braces. SAL Green Beret, SA Green beret with tartan backing or Regimental Headdress. Issued medals on the left chest – court mounted. SAL pin on the left lapel. If worn, the RBL poppy pin or paper poppy is to be worn above the SAL pin on the left lapel. A maximum of three merit, operational and qualification badges. Beret with Tartan backing. This document will provide some history of the tartan and how to mount it. 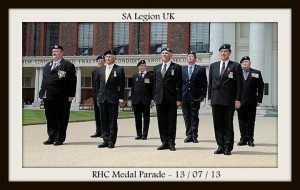 NOTE: Some parades – especially those hosted by sister organisations such as the Royal British Legion – carry special additional dress code requirements so please pay attention to parade orders.